The wait is finally over, Justin Bieber fans! “Boyfriend” — the first single off his upcoming album Believe — hit iTunes early Monday to incredible fanfare. Does it live up to the hype? Judge for yourself. Justin Bieber’s come a long way since the days of “Baby.” Need proof? Listen to the first single from his upcoming album, Believe. The 18-year-old pop superstar has a more mature voice and a new sound to go with it. We’ll say it: He sounds like a FutureSex/LoveSounds-era Justin Timberlake. No, we don’t think he’s copying him, but the similarities are definitely there. The boyfriend of Selena Gomez even enlisted the help of a superstar producer to get his new sound, Mike Posner. We’re interested to hear what else Bieber has planned for Believe now that we’ve got our first taste of “Boyfriend.” He told Ryan Seacrest on Monday morning that we can expect to hear plenty of pop classics on the upcoming album. As for the Timberlake comparisons? Bieber didn’t mention him by name, but he made sure to emphasize that the album is all about him — and no one else. 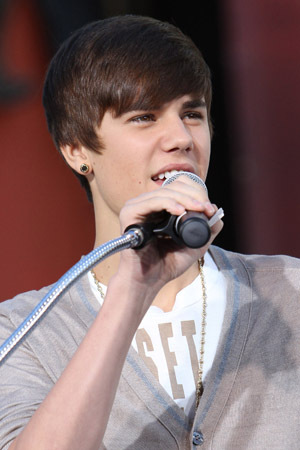 Justin Bieber released his newest Single, Boyfriend, Monday night. It featured the artist rapping some interesting lyrics… check out the Buzz to see these lyrics analyzed.